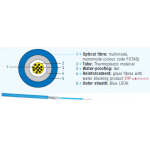 Optical fibre : Multimode (FOTAG color code) Tube : Thermoplastic material Tube waterproofing : Gel Reinforcement ..
ACOLAN® 550 UFHorizontal cable 10 Gigabit Ethernet U/FTP - Category 6A - 4PairApplications 10 Gigabit high speed data transmission cables..
Optical fibre : Multimode (FOTAG color code) Tube : Thermoplastic material Tube waterproofing : Gel ..
ACOLAN® Loose Tube 6 fibers – Indoor/Outdoor – LSOH Dielectric – Dry water tightness 9/125 OS1 The ACOLAN optical of..
ACOLAN® Loose Tube12 fibers – Indoor/Outdoor – LSOHDielectric – Dry water tightness62.5/125 OM1The ACOLAN optical offer addresses all the r..
1. 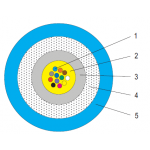 Optical fibre : Multimode (FOTAG color code)2. 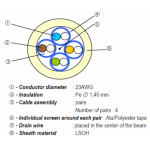 Tube : Thermoplastic material3. Tube waterproofing : Gel &..
ACOLAN® Loose Tube 4 fibers – Indoor/Outdoor – LSOH Dielectric – Dry water tightness 62.5/125 OM1 The ACOLAN optica..